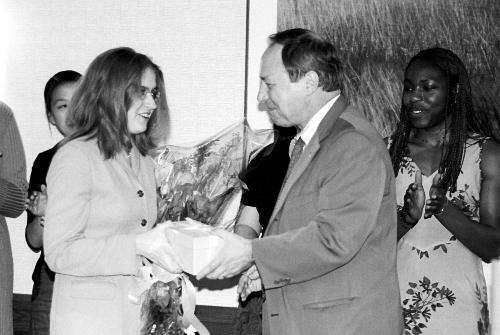 Dean of the College HARRY R. LEWIS ’68 (R) hands LAURA E. CLANCY ’02-’03 her award for outstanding student achievement at the Women’s Leadership Award Banquet yesterday. Four prominent Harvard women leaders were recognized at the annual Women’s Leadership Award Banquet in a ceremony held last night at the Charles Pavilion. Laura E. Clancy ’02-’03 received the award for outstanding student achievement, with Dorothy A. Fortenberry ’02 and Lavanya Kondapalli ’02 receiving honorable mentions. The award carries with it a $750 stipend. Ellen H. Goodman ’63, a Pulitzer-prize winning columnist for the Boston Globe, received the Women’s Professional Achievement Award. Clancy, the current president of the Phillips Brooks House Association (PBHA), spoke about the meaning of leadership in the context of public service. Clancy said she was not focused on gender in her search for role models, and said she looked up most to her father. “I didn’t have a lot of women role models, I just knew a lot of people who worked hard,” she said. She called on women who aspire to be leaders to focus on actions rather than image. “You’re not what you eat, you’re not what you wear, but you are how you spend your time...and how you treat other people,” she said. In her speech, Goodman emphasized the great changes women’s roles have undergone over the years. “My major job as an undergraduate was to serve tea at the Harvard Law School,” she recalled. Goodman also spoke about her experience as a columnist for a major daily paper. “Being a columnist is like being married to a nymphomaniac—once you think you’re through, you have to start all over again,” she said. In closing, Goodman said she was optimistic about the progress of women leaders at Harvard. “Walking on water wasn’t built in a day,” she said, quoting the poet Jack Kerouac. The award, set up by Terrie G. Fried Bloom ’75 five years ago, solicits peer nominations. This year, the program drew a record 82 nominees—58 of whom completed the full application process and were invited to the banquet last night. “All of the nominees are very impressive...the nice thing is [in spite of how competitive it has become] we can still honor all of [them] with this banquet,” said Assistant Dean of Harvard College Karen E. Avery ’87, who serves on the selection committee that includes faculty, administrators, and alumni.